Designed for perfect fit two way radio. The six-way charger can charge 6 sets walkie-talkie (or batteries) simultaneously, that makes you more efficient faster and save your time. Dimension: 490mm x 110mm x 60mm. Output (Li-lon 2x Cells): 8.7V/500mA. Output (Ni-MH 6x Cells): 9.4V/500mA. Output (Li-lon 1x Cells): 4.2V/500mA. Baofeng: UV-5R, UV-5R V2+, UV-5RA, UV-5RB, UV-5RC, UV-5RD, UV-5RE, UV-5RE Plus, UV-5RQ, BF-F8, BF-F8+, BF-F9. Pofung: UV-5R, UV-5RA, UV-5RB, UV-5RC, UV-5RE, UV-5RE Plus, BF-F8, BF-F8+, BF-F9. 2 x NKTECH 6-Way Universal Rapid Charger (Not included Two Way Radio & Battery). 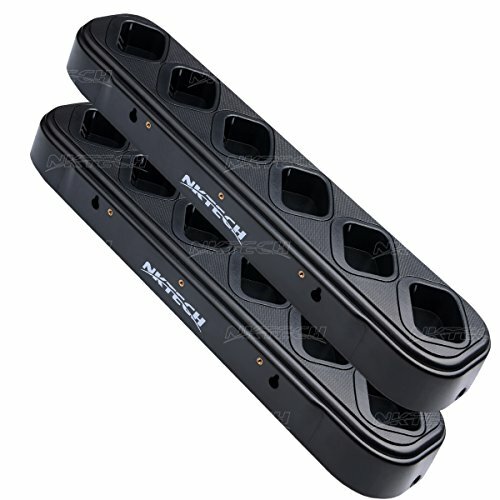 2 x NKTECH PSU With Power Cord (US Plug). NKTECH 6-Way Six-Way Universal Rapid Multi-Charger. For Baofeng/Pofung UV-5R, UV-5RV2+, UV-5RA, UV-5RB, UV-5RC, UV-5RD, Two Way Radio. For Baofeng/Pofung UV-5RE, UV-5RE Plus, UV-5RQ, UV-5RS, UV-5RL, UV-5RO, Two Way Radio. For Baofeng/Pofung UV-5RL, BF-F8, BF-F8+; TYT TH-F8, Two Way Radio.